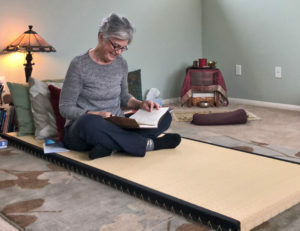 My daily moves begin as my feet hit the floor first thing in the morning when I get up from my tatami board and mat on the floor where I sleep. Putting on my clothes I stand on each leg as I pull up pants, pull on socks, and shoes. 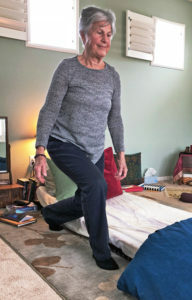 Again a victory feeling as now after many years practicing the Figure Four exercise with socks and shoes off and on, I can achieve this dressing activity without hanging on or leaning on furniture. This has strengthened my muscles. I in turn use this strength daily. On my way down the hall to downstairs, I am mindful of posterior push off. No mincing steps for me!! I repeat this move all day. Going up and down the stairs I keep my shank vertical. 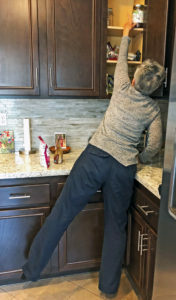 In the kitchen, I stretch and stand on tiptoe to reach my favorite cereal toppings and put them back in their place on the top shelf. 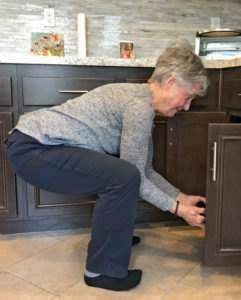 I squat and reach (no fancy pull out shelves for me!) to find pots and pans stored on lowest shelves. I continue reaching moves for plates, vitamins, etc. It feels good – I feel more powered and awake. 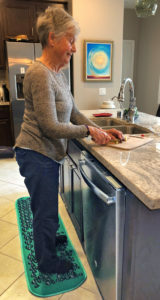 When standing to prepare fruit, veggies, stirring soups, looking for food in fridge, waiting for water to boil, I check in for the weight over the heels and on both feet equally. ( I have a life-long habit of standing on my right leg with weight over toes). Once corrected I feel the muscles that were compensating relax and feel a wave of comfort in my back, shoulders, neck and glutes. 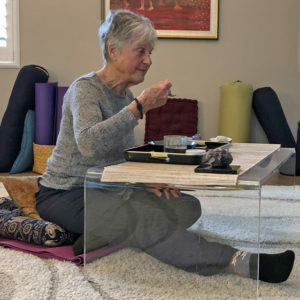 To eat my meals, I take a tray with my food to one of three places: a coffee table in the living room with a pillow to floor sit, elevating my tail bone to neutral; a ball chair at the dining room table; or occasionally sitting at a bar chair at my counter (alternating the legs for the sitting Figure Four stretch). Cleaning, scrubbing, sweeping, mopping, dusting, vacuuming, scouring moves are my gym! I think you see why. 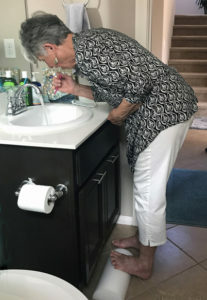 After an hour of that, I usually work up a sweat and I have a two for one – the movement of cleaning chores is whole body exercise, I feel good, my home is clean, and I still have the money I would have paid for those services in my bank account. Ditto for gardening. For a desk I use a portable laptop stand to hold my laptop computer or book. It shifts to different heights to use sitting on the floor, standing at a counter or table or squatting! This stand also accommodates books, notebooks for journaling, etc. 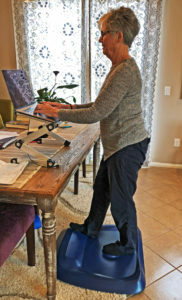 When doing standing computer work I take advantage of doing moves such as my calf stretches, top of foot and bottom of the foot exercises. I have furniture in my home – couch, easy chair, dining room table and chairs and bar stools – all for my family, friends and guests who mostly prefer furniture. 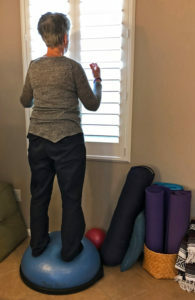 I also have a nice soft rug, bolsters, pillows and mats for all styles of floor sitting, squatting, kneeling and yes, standing and reclining – all moves aligned and in comfort. I made a promise to myself five years ago that I would walk with purpose to do errands. I enjoy these errand walks and carry home purchases giving my upper body a workout. I also walk with friends as that is a great way to socialize and walk which are both top priorities in my life. I enjoy walking on the earth, roots, grass, small rocks, pebbles, boulder rocks, and meadows whenever it’s possible. 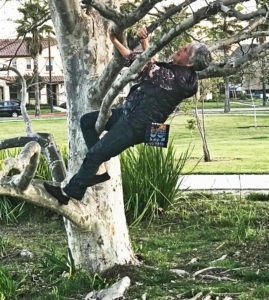 I love finding trees with limbs just waiting to be hung on, swung on and climbed. I love beach walks at all times with mostly low tides and the easy walking on broad firm sand between incoming tide, tide pools and the soft sand beyond. I bring my focus to how my body is aligned all day long. 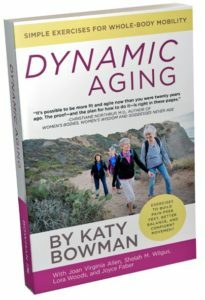 (See our book Dynamic Aging: Simple Exercises for Whole-Body Mobility, pp. 167-169). 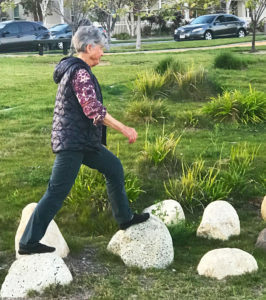 This is the basic foundational practice I incorporate in my daily life whether I’m doing household chores, walking for pleasure, hiking or walking to do errands. 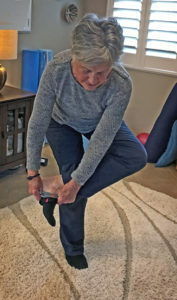 All day I check into my plumb line from my ears to shoulders to hips to knees to ankles with weight mostly on the heels, the toes are mobile – not weight bearing. When I correct to this alignment, I immediately feel the release in my shoulders, neck and back. Over the years I have learned, taught and practiced the Restorative Exercises of Nutritious Movement®. I use minimum aspirin and other over the counter pain relievers. I still do not need Rx medication for pain or joint repair surgeries. I use MDs when they are needed. However, my usual first line of health and prevention is my chosen life style which includes Nutritious Movement and the use of complementary healing modalities: chiropractic, body work (cranial sacral, myofascial therapy, massage), meditation, contemplation and am passionate about my friends, family and life purpose. Our bodies are whole, not divided into the physical, mental, emotional and spiritual. What is true for me and probably for most people, is that when we heal on one level that will also manifest with greater ease and function on all levels. I incorporated Nutritious Movement® into my life over 12 years ago and still use it as my go-to owner’s manual for the body. It’s been fun to share with you and I wish you good luck in your practice. I love this blog post. So many good ideas! I’m going to look into the desk. Where did you get the long rock rug in your kitchen? This is wonderful and soooo inspiring! You are amazing! I love the focus on movement AND purpose! Thank you for sharing this!!! This is a perfect example of how easily the foundational practices can be incorporated into our daily living routines. Thank you. Such an awesome article. And with some great ideas!!! So inspirational! Just the nudge I needed to keep trying! Inspiring and instructive, thank you! As an aside, what brand is your laptop stand? Very practical! This is the wonderful info we need to know what to do and see what works! Thank you! Hi, thanks for this great article. I really like the way you move! 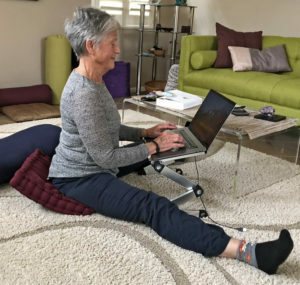 🙂 In the photo of you at your standing desk, you’re standing on a mat. Looks like it has a built in elevated area at the front of the mat that works for calf stretching. May I ask where you found that? It would be a nice addition to my standing workstation. Thanks! Hi Paula, I could not find any mark of identification on the mat in the photo. However Amazon, standing desk mats has dozens of varieties. Terra mat is the closest to the one I use and it appears to have a more practical design. I do think a mat with a built in elevation changes is useful. Good luck! This is so helpful in demonstrating how to incorporate movement throughout the day. Thank you so much! What an inspirational and educational piece you have written, Joyce. 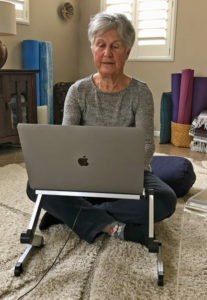 I practice the same stuff in the hope that I will be as healthy and mobile as you and the other dynamic agers when I am 81? Great post, Joyce! 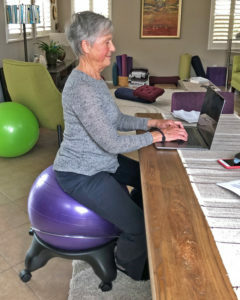 I was thinking of getting an adjustable desk but I like the look of your laptop stand. What brand is it? I assume you would recommend it?